Is the Consumer Product Safety Commission Doing Their Job? Even before the recent flurry of children’s toy recalls, I questioned the effectiveness of the Consumer Product Safety Commission (CPSC) when they failed to act on the presence of lead in children’s lunchboxes. The news has only gotten worse, since I wrote about it last February. Almost everyday, I receive a new email from the CPSC listing more toy recalls, mostly for lead content. How can this be? Who is protecting our youngest consumers? Lead poisoning interferes with neural development in children and developing fetuses. High levels of lead in children can cause learning and behavior problems. The CDC considers lead levels in the blood above 10 micrograms of lead per deciliter of blood to be a concern in children. But some studies have shown harmful effects in children with lead levels measured at or near the current standard. 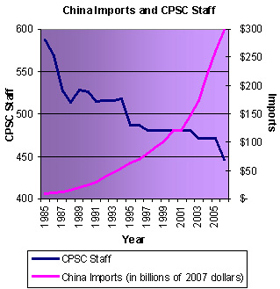 The CPSC was created in 1974 to protect consumers from the expanding globalization of products. 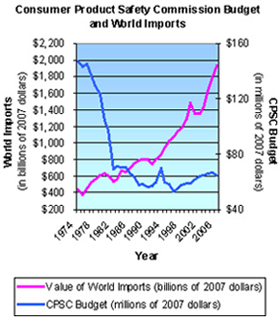 Since its creation, imports to the US have increased 338 percent, yet the CPSC’s budget is less than half of what it was in 1974! While we buy more overseas products, the US government has been cutting staffing for this agency, limiting its ability to regulate imports and protect consumers. The agency began with 800 employees in the seventies, and now the CPSC has only 420 staff members. Currently, there is a bill written to empower the agency: The Safety Assurance For Every Consumer Product Act (SAFE), yet CPSC chairperson Nancy Nord opposes this bill. Provide additional resources to the CPSC. But the change that we’ve got to have is change that is going to be constructive, workable, and is going to help the agency do its job. My concerns with the Senate bill is that it includes a number of requirements for undertaking activities that are really outside our core mission. For example, it has us mediating employer and employee disputes in whistleblower cases. It has us implementing or enforcing intellectual property rights violations in some instances. It has us certifying laboratories. Nord has also come under scrutiny lately for traveling on toy industry dollars, and many people are calling for her resignation. So this is nasty stuff, and it appears that the chemical is actually converting into it in the body.” Of course, Aqua Dots was manufactured in China, where most of the recently recalled toys have originated from. All toys sold in America regardless of where they are made must conform to tough U.S. safety standards – standards that have served as models for other industries and countries around the world. Since it is companies, not countries, that make toys, it is companies that are responsible for adhering to rigorous safety standards and conducting inspections throughout the process. Random on-site and off-site testing occurs in all manufacturing plants, in China and elsewhere. Toys are also randomly inspected before export to the US. In light of the recent recalls, there has been additional testing and vigilance by toy manufacturers, retailers and importers. Somehow, these assurances don’t make me feel better in light of recent events. I will stick to researching reputable companies, such as Plan Toys, and homemade gifts for my children. I will continue my efforts to educate my children and family on junk toys and hope that one day, we can once again shop safely for children’s toys. Seriously, date rate drug? How in the world does that end up in toys? I cannot get over that. It is a true testament to the greed of manufacturers that they can’t be bothered to create safe toys for children. When I have kids, there will be as few cheap plastic toys as possible. I just hope I can get the relatives to do the same. C4H6(OH)(COOH) is GHB which is produced through certain fermentation reactions. it probably wasn’t intentional on the part of the manufacturer although there are cases where poisons have been substituted for otherwise safe compounds. many years ago in the USA, Ethylene Glycol was used to dissolve Sulfanilamides to be used as a medically active syrup for treating bacterial infections. It was cheaper than Glycerin and did the job just as well as far as dissolving the drug but it metabolized into Oxalic acid which killed a lot of people. after that, the USA put far more strict laws into effect to protect people. Now the same thing is happening in China, fake eggs, ethylene glycol instead of glycerin etc.. all for greed and all are the symptom of that stage of economic development. yes I agree, it is greedy but it is nothing new. the United States was the same way as China and so was Japan a little after WW2. Eventually things got better after the economy grew and recovered. Thank you Mike for your explanation and optimism. I do hope things get better. Greed is definitely factor, but Americans demand for cheap goods is also to blame. If we (and our children) could be satisfied with less, then we could afford sustainably produced goods and place such demands on the market. I just overheard a local toy store merchant, who features many quality wooden toys, say that this will be a “make or break year” for her business. It is hard for local shops to compete with the Walmart effect. I agree. We demand the cheap stuff and it’s been extremely difficult for mom/pop shops to deal with the big boxes. But, I smell a change in the air. And I’m hoping as people become more aware of these situations, not only whats being put in our toys, but the conditions under which many (not all, but many) are made, people will choose to send their business elsewhere — to artisans, handmade artists, and folks who have spent years making sure their toys are safe. They are TOYS for goodness sakes! Referred by David at It’s Not a Lecture. So glad to have found your blog. C’mon people. We have to do what WE can as individuals. Grassroots here. BAN CHINA. Spread that around. Put it on bumperstickers. Tell everyone you know. LOOK AT WHAT YOU BUY. Is it a toy, toothpaste, jewelery and ‘Made in China’? Put it down and walk away. Control the spastic spending! Educate yourself on global economics. Demand QUALITY vs QUANTITY. Besides, China is a communistic country that uses slave labor to produce that little lead covered trinket that your child is better off without anyway. WAKE UP AMERICA! BAN CHINESE IMPORTS! Bring our economy home!!!!! I couldn’t understand some parts of this article Is the Consumer Product Safety Commission Doing Their Job?, but I guess I just need to check some more resources regarding this, because it sounds interesting. I couldn’t believe it when I read this article – it was quite a scary thought regarding dangerous materials. When my kids were younger the majority of toys at that time were mostly plastic and we didn’t know much about this issue. I always try to go for eco-friendly products with kids of friends and family and also tell them why I do it. Daily Tip: Lower the Thermostat and Put On a Sweater!